How did these divisions between Whigs and Democrats in the mid 19th century affect the foreign policy of the early United States? One area whee there was some difference was trade- as already stated the Whigs were more sympathetic to protection. This was not invariable Pennsylvanian Democrats often claimed to be pro "protection" -particularly at election time though in fact it was Buchanan the mightiest Pennsylvanian Democrat who as president pushed successfully for the lowest tariff of the era. This helped create a deficit and also lead to him being blamed for the "panic" and recession of the late 1850's. The Democrats under Jackson in particular pushed trade agreements. The Jacksonians agrarian bias did not necessarily or always mean an indifference to markets for all their strength among Subsistence farmers. It also led them to support new markets for agrarian products-it was the subsidisation of production rather than its trade they objected to. Whigs though keen on tariff revenue did not necessarily oppose such measures-though their greatest achievement in this regard was China under Tyler-who in many ways was as discussed previously an extreme Democrat in his views and was disowned by his own party. Oddly this was not true under Jackson. The main land dispute with Mexico lay in the future which was one major reason. However Jackson was actually very cautious with Britain on territorial disputes-. This same caution was followed in his refusual to annext Texas over Mexican oppostion and British scepticism. One says oddly because Jackson and his supporters made and to some degree still make much of his supposed Anglophobic and aggressive personality. Indeed a "Jacksonian" foreign policy is oftne used as a label for an aggressive and hawkish one. If one excludes Indian removal (not seen as a foreign policy issue at the time)this would suggest Jackson's foreign policy as president was not very "Jacksonian"! Jackson's keenness on trade and arguable his worries about threats to slavey ensured he was very worried about upsetting Britain whihc was both America's most important trading partner and an incresingly anti-slavery superpower.It's also worth pointing out that the notion of Jackson being blindly driven by his emotions is just very dubious. John Quincy Adams at one point referred to Jackson's "utmost calculation"-and his foreign policy as with his many political moves suggests that actually Jackson may have been much less driven by "unreasoning rage" than his opponents. However in the 1840's foreign policy ended up being a huge area of conflict between the parties. This was as so much in the Democratic party partly a result of Jackson's' influence- he was key in getting another protege the pro annexation (and it was to prove pro land acquisition of Mexico) James K Polk selected over the former president (and also a Jackson protege)Van Buren in part because Van Buren took a Whig line of wait and see on annexing Mexico. Even more important was Tyler and Polk. Tyler raised the issue of Texas annexation-in large part in a vain attempt to gain enough southern support to win reelection as a president who was now without a party. Polk was key to the decision both to wage a large war against Mexico-and to annex huge chunks of land as part of the victory settlement. Indeed Polk was furious with his negoitator for the eventual deal-he thought he hand't got enough territory. So partisanship was a powerfull motivation in the divisions between the parties on Foreign policy- Democrats mostly supported Polk and were tepid on Tyler. The Whigs ultimately loathed both. However these differences also reflected the ideology and support bases of the two parties and it's worth examining why. As already shown the Whigs wer the party which attracted more Evangelicals and anti-slavery zealots. Texas was a slave state and Mexican land looked like it could become one (Mexico had banned slavery so this would be an extension). Naturally such groups were hostile to the idea. Northern "yankee" (new engalnder) and evangelical culture also recoiled from the details of the beginning of war for example apparent American aggression much more than the dormant forces in the Democratic coalition they bought into a moralistic vision of Foreign policy. Paradoxically the fact Whigs by the 1840's were getting the votes of most slave owners reinforced this tendency. All slave owners already had plantation land (or worked on it in the case of plantation hands) - southerners without an economic link to slavery (much more strongly Democratic) were often eager to acquire new territory to have their own plantations. Of course being the party of slave owners and anti-slavery zealots also meant Whigs were very wary of acquiring new land-because the federal government would have to have a policy on slavery as regards it-and two key parts of their coalition would clash on it threatening the party as a whole. This problem was not helped by their active view of government power and elitist model of political representation. Democrats at least northern one's by contrast hit upon an expedient to manage such division-the notion of "popular Sovereignty" white men should decide whether slavery was true or no. This notion was summed up well by Stephan Douglas (to a certain degree as much as any man it's inventor) in the famous Lincoln-Douglas debates (a few years after the fall of the Whig party but in which he was defending essentially the same stance) "there is no man in the State who would be more strenuous in his opposition to the introduction of slavery than I would; but when we settled it for ourselves, we exhausted all our power over that subject. We have done our whole duty, and can do no more. We must leave each and every other State to decide for itself the same question. " This kind of reasoning was to fail Democrats in the 1850' for southern Democrats support of slavery proved unmanageable-but it wasn't' really a starter for Whigs. The different attitudes of the two parties to economic-and even more industrial and urban development also drove their differences on Foreign Policy. The Whigs arguably saw American development as taking place through something like the type of economic growth we are familiar with. At the very least they saw it as being based on the development of commerce. Thus expansion was not necessary for a more prosperous United States-indeed the risks war posed for commerce might hurt it. Democrats on the other hand tended to be more likely to see agriculture and hence land as the core to prosperity-more land for the people of the united States meant more prosperity-and indeed for most of human history this had not been bad rule of thumb.This led the Democrats to a much more sympathetic attitude to expansion. Another reason was location-the most Western States most notably Texas but also Illinois, Indiana or Missouri were mostly Democratic strongholds Thus their call for expansion and the desire of people of that state to gain more land and room for movement resonated more strongly among Democrats. They also reasonably thought any new states were likely to be Democratic. Ironically most of the states ultimately carved out of the cession were designed to be anything but-but by the Republicans not by the long dead Whigs. One irony of this was that the Democrats the party of small government and suspicion of credit were the party that in the late 1840's raised expenditure and borrowed considerably in order to finance the war. This reminds us that in the early 19th century the expenditures of wars-even relatively modest ones were the biggest expenditure of the State. The Democratic party Agrarian oriented politics led theoretically to low expenditures . In practice however this was complicated by the hawkishness and expansion that same politics helped underpin. This picture shows various points of American expansion-note the three great territorial expansions of Texas, the Oregonian Territory and the Mexican Cession. 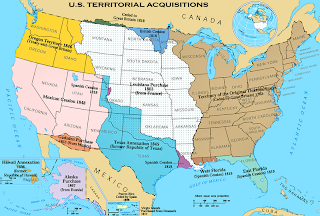 Eight current US States, and large chunks of another five date from the agreements of the 1840's. These are lasting monuments to the success of the Jacksonian Democracy in achieving so much of it's mighty foreign policy aims.